Seiko automatic movement 6R20. 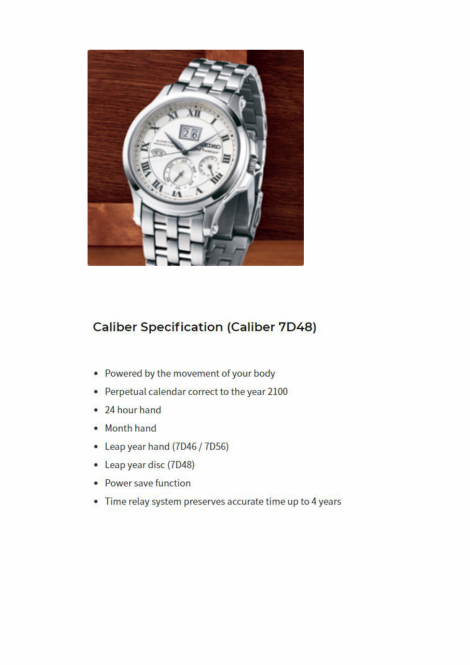 This high grade caliber is designed to place the Seiko firmly in the high quality mechanical market. 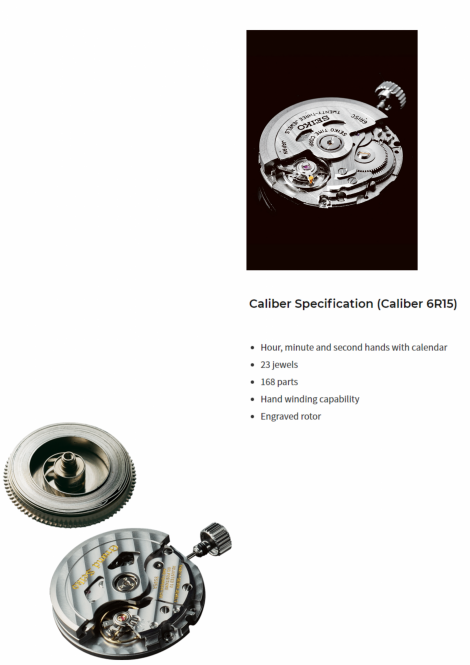 The 6R20 movement is made of parts, all of which except rubies, are produced and assembled by Seiko Instruments Inc. The movement is exquisitely finished with an engraved rotor, polished edges to the bridges and hairline shading on the main surfaces. The high beat (28,800) movement delivers accuracy of -15~+25 seconds a day and the Spron 510* mainspring generates a power reserve of more than 45 hours. * Spron 510 is a high-elastic material developed by Seiko Instruments Inc., and its registered trademark. 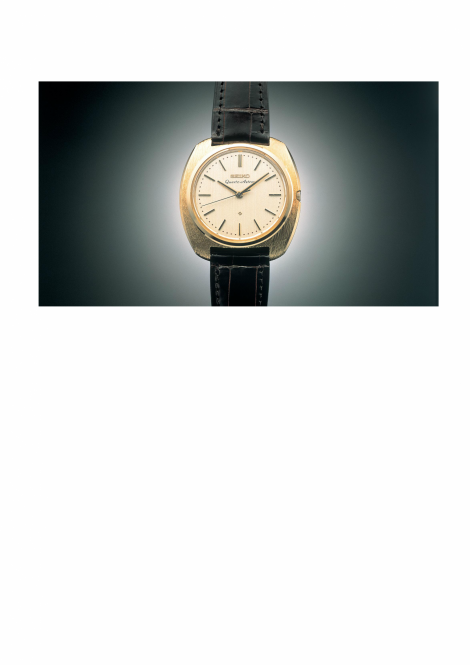 In 1969, Seiko succeeded in resolving all these issues and made available to the world for the first time a commercially viable quartz watch. It was a long ten years since the start of development plan of crystal oscillation watch at Suwa Seikosha. 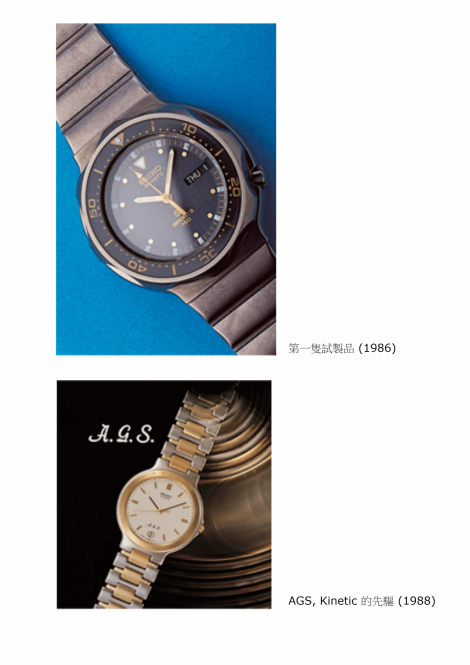 To develop a quartz watch for practical use, unique technologies only available by Seiko were created. For example, adoption of a crystal oscillator cut in the shape of a tuning-fork and development of an IC and step motor to properly operate signals from a crystal oscillator had to be created. 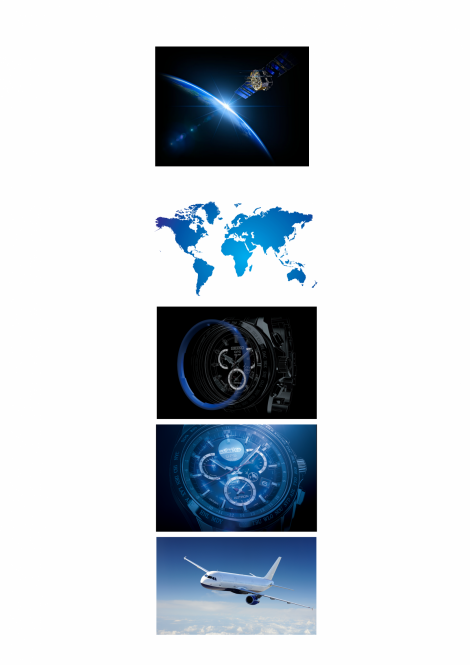 Additionally, with a passion to change the future of watches, Seiko did not pursue monopolization on patent rights of those unique technologies and opened them to the world. Later on, many technologies provided by Seiko became world standards and have contributed to development of present day quartz watches. Seiko Kinetic Direct Drive is the embodiment of the Seiko's ‘emotional technology’. It offers valuable additions to the ecological and convenience advantages of every Seiko Kinetic watch. 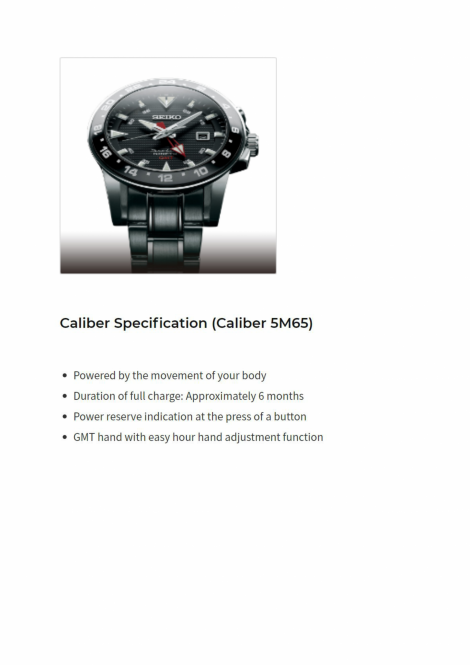 As in all existing Kinetic calibers, the wearer automatically generates electrical energy by her/his wrist movement. 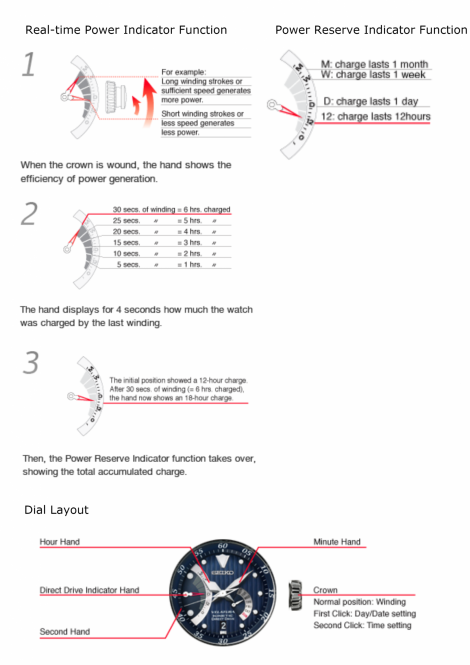 With Kinetic Direct Drive, however, the wearer can also generate energy by winding the crown. Kinetic Direct Drive shows not only the power held in reserve but also the level of power generation when the wearer hand-winds the crown. The wearer can see and feel, in real time, the direct transfer of power from his or her winding of the crown to the power reserve. Kinetic Direct Drive creates a direct interaction between wearer and watch! The marriage of Kinetic with a GMT function makes this the perfect travelers' watch. The hour hand can be set without disturbing the accuracy of Seiko's unique Kinetic movement, and as Kinetic is powered by the movement of your body, this streamlined and refined new timepiece offers the international traveler a unique combination of elegance, powerful design and ‘set & forget’ convenience.